Here some more of my 80s pics with a few recent ones from Max. 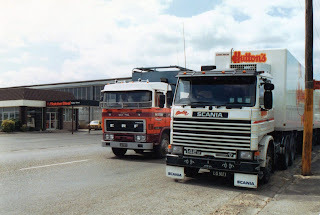 Neal Machirus's fleet wasn't large, but he was a great believer in the Scania breed. 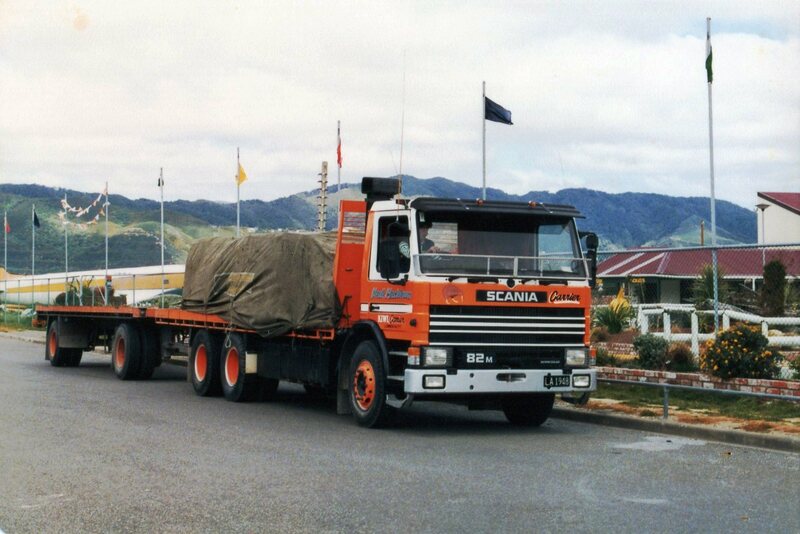 6 wheeler rigid N10 Volvo with trailer of Hookers at Seaview. 1983 Mitsubishi supplied by Ed Barker trucks to J.D.Lyons parked up for the night. There would hardly be two more different trucks. 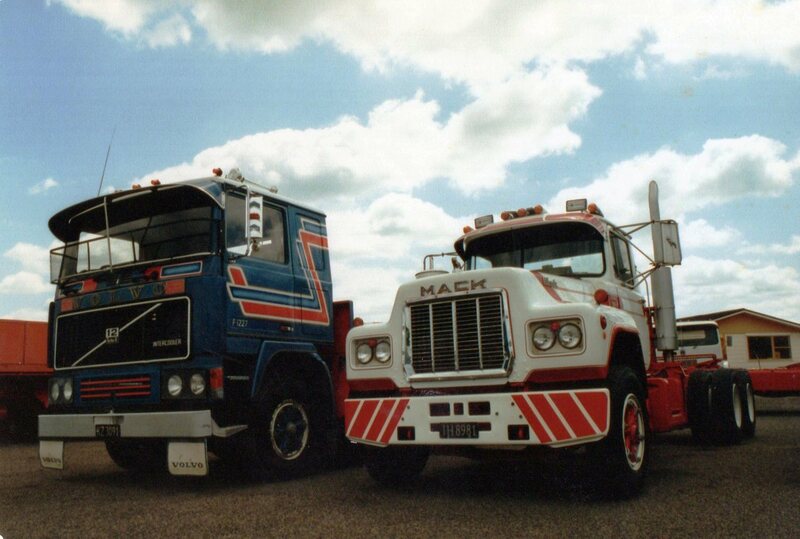 The big spacious cab-over Swede and the crammed conventional American. Volvo F12 and Mack R series for sale at MTD in Palmerston North. 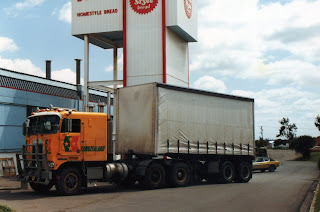 Also in Palmerston North, "Sizzler" the R142m Scania of ham and smallgoods producer, Hutton's is stationary while an ERF stock truck passes by. 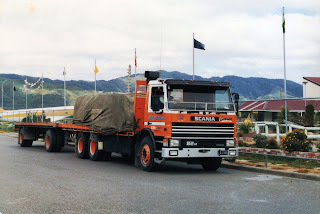 Palmerston North again sees this K100 Kenworth with curtain sided second trailer of a B-train. Car Distribution Group Isuzu passes Max's house with a load of 4 Toyotas and one Holden. 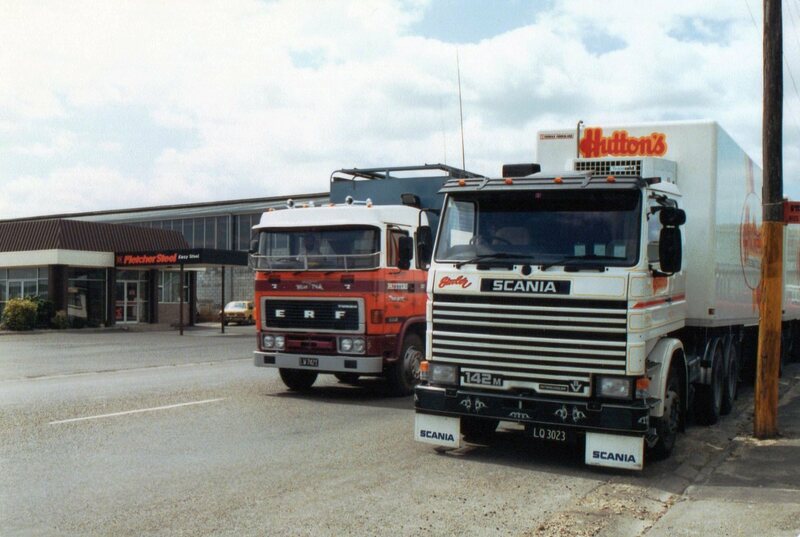 Palmerston Transport Services started with a tow truck and a vehicle transporter. Then progressed into specialised vehicle transport, moving things like large tractors, diggers and forklifts. Although this type of work still forms a large part of their business, they now move almost anything and trade as PTS Logistics. This 4 axle Freightliner Argosy tows a 4 axle trailer with single tyres and loaded with a 40 ft container. This Nissan operating for AF Logistics, still carries the colours of Foodstuff's own truck fleet. 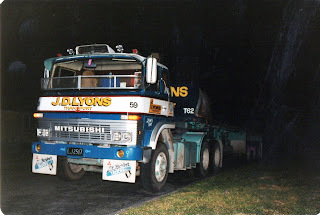 Another 4 axle Argosy, but this time a rigid with 4 axle full trailer of Linfox. Little Mitsubishi carrying a skip bin. 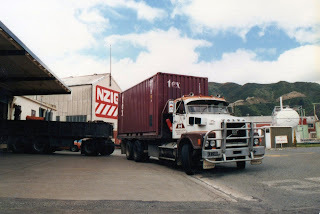 20 ft container this time pulled by a Mack Vision from Daily Freight; part of the Mainfreight group.